Documents from the courts pertaining to the October 3rd SWN Injunction/ Notice of Claim and the November 22nd Injunction/ Notice of Claim. Our Kent County chapter of the Council of Canadians, a group of citizens previously known as Upriver Environment Watch, has been corresponding with your office for more than a year. 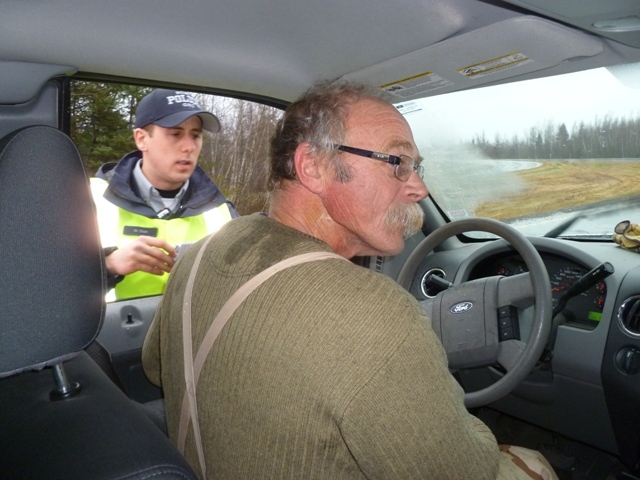 In addition, many allies in Kent County NB have been cooperating with Commission staff on your investigation into policing conduct during the 2013 anti-fracking environmental protection and protest activities in our region. Following is supplementary information on several issues that are very closely related to your investigation. It is likely you are as frustrated as us about the length of time it is taking to produce your final report: almost 2.5 years from original complaints. We believe it is not the writing process that is slowing you down. Your Commission has the task of slogging through a mass of complicated complaints, attempting to verify information presented to you, reconstructing events, and seeking interviews with the RCMP to corroborate or deny these complaints. Then there are the tasks of reviewing pertinent RCMP policies and procedures (or lack thereof), and analyzing your findings. Not the least of your problems must be actually getting relevant RCMP paper and digital files. Still, this time delay is worrisome for a very practical reason. While your commission carries on this investigation, some of the same experiences we had with the RCMP are being repeated in other regions of Canada. If your report addresses only 2013 circumstances without at least acknowledging the matters we present below, there is risk of producing a “freeze frame” document that makes it look like the issues are in the past. To our knowledge, Critical Infrastructure Intelligence Assessment: Criminal Threats to the Canadian Petroleum Industry remains the RCMP’s perspective on united groups of people acting to protect the environment. If this document is still central to RCMP analysis, nothing has changed or will change. We hope this is already within the scope of your investigation. We do not wish to further delay your work with the information below. However, we do think it is important that you consider, as you write this report, the “2015 reality” regarding RCMP operations and strategies at protests and protector camps that involve Canadian settler and indigenous environmental activists. Much of the information in the next few pages comes from a Forum on Fracking sponsored by KAIROS, an ecumenical Christian network that unites eleven national churches and religious orders on work related to ecological justice and human rights. Motivated by this mission, KAIROS sponsored a two-day national forum on fracking, environmental justice and human rights, held October 30/31, 2015. I was a speaker at the Moncton end of the forum, which was linked by digital technology to a simultaneous forum in Vancouver. Two indigenous women at the Vancouver portion spoke about policing abuses of rights that occurred in the environmental protection campaigns with which they are involved. 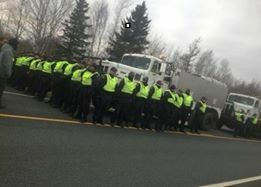 Some of the matters they raised are identical to some of the issues we have raised here in New Brunswick in regards to RCMP conduct against our united anti-fracking movement. Following is some information about this, from my notes from their presentations, intermixed with some commentary from me. This year, as the resource extraction industries were becoming more impatient about entering Unist’ot’en territory, the RCMP constructed their own checkpoint outside the indigenous territory on the same logging road. They were stopping cars, and asking all people in them to show their ID, thus intimidating them. RCMP were also doing such things as telling visitors from other countries that they could be deported for this. This report is very similar to what we experienced here in Kent County in 2013: on Airport Road in July, and on Highway 11 in November and December. 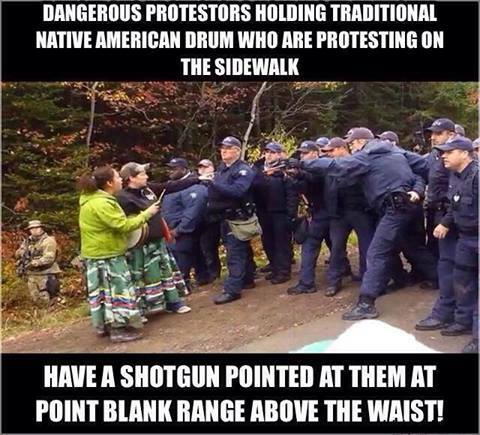 RCMP stopped people going into, and sometimes away from, protest sites. They asked for ID from drivers and passengers. When people passed police checkpoints frequently, it seemed their names were cross- checked. Some felt intimidated, possibly even targeted for harassment. Above is one photo of this actually happening. In this occurrence, which was in November 2013, I was riding in the small backseat of a half-ton truck. We had left the protest site on Highway 11, and there was another passenger in the front seat on the right. It was a cold day and we were on our way to the nearby town to pick up coffee for our allies. 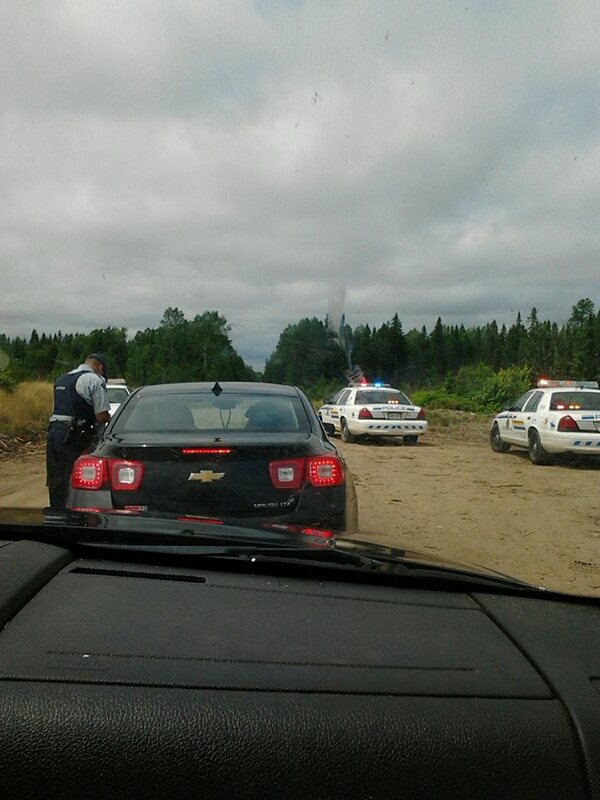 Just a few kilometers down the road, we noticed there was an RCMP car behind us. As we made our way up the ramp at our exit, the cruiser’s lights and siren went on, and it was clear they wanted us to pull over. When we pulled over, the two officers in the cruiser came to either side of the truck. We first noticed the one by the driver (shown here). The driver rolled down his window, and was asked to present identification for himself and the vehicle. When he asked why, he was told this was just a “document check.” As the driver was gathering the paperwork together, we noticed that the second officer was standing by the front passenger window. That passenger rolled down her window, and the officer asked for her identification. She began looking for her wallet. At that point, I intervened and told her that she did not have to provide this, under these circumstances. She told the officer what I said, and the officer went away. Sadly, these officials carry guns and have the capacity to turn violent, to arrest, and to otherwise make civilian lives miserable, so all too often people allow their rights to be violated — or perhaps do not know they have the right to decline. Here are two big questions. Why do the original Peoples and other citizens of Canada need to get lawyers to remind the RCMP what they can legally do or not do? Why is it up to us to put them in check when they are operating outside the law? Although this was not mentioned during the KAIROS forum, according to social media and eyewitness reports, apparently there was recently a massive, hopefully temporary, influx of RCMP tactical units and such personnel in communities around the Unist’ot’en camp area. There was serious concern that this huge build-up of RCMP presence signaled the onset of preparations for an intervention/invasion similar to what happened here in Kent County on Route 134, in mid-October 2013. Public call-outs for support seem to have averted this for the time being. Unfortunately, that chapter of their ordeal may not be behind them. Lax Kw’alaams is a territory in what is now called British Columbia where nine of the fourteen Tsimshian tribes reside. More than seventy days ago, in August 2015, Hereditary Chief Yahaan (Donny Wesley) began a continual occupation of their territory to protect the salmon habitat and other ecological features of that region, for future generations of all life. A core issue in this campaign is that this is one of two most important habitats in Canada for salmon, who are now a species at risk on both coasts, due to industrial activity and perhaps other causes. Specifically, the place called Flora Bank is of enormous importance to the salmon, and is a sacred place to the indigenous people of this region. The young salmon go to this place where fresh and salt waters mix, to “get tough enough to leave” the estuaries and travel out into the open saltwater sea. Destruction of this water habitat is inevitable if the industry (“Petronas” in this case) proceeds with its plan to construct an LNG terminal in that vicinity. The reason I am introducing this to you is to make sure you understand that the people who are trying to protect this area are doing so for the very best of reasons. More about this issue is covered in this editorial blog Council backs Lax Kw’alaams Hereditary Chief’s letter to prime minister opposing LNG project, which was written by Brent Patterson, the Political Director of our parent organization, the national Council of Canadians. As you will see in Brent’s column, the people already voted to not accept the corporation’s offered financial package of $1B in return for consenting to construction of the LNG terminal. Up until a few weeks ago, a modest amount of “test drilling” was already taking place there. Damage has already begun, which was reported at the KAIROS forum in some detail. (See the link to both Ms. Martin’s and Ms. Huson’s presentations at this forum, in endnote #2 below). As I understand it, very recently the B.C. government over-ruled the Indigenous People‘s vote and announced that permits had been issued for test drilling. This resulted in an immediate increase increase in the number of drilling-rigged ships now working in this water – to a total of six! These permits were issued on the grounds that test drilling of the river bed would not impact the salmon and other sea-life habitat. The indigenous protectors see damage happening, but as Ms. Martin pointed out in her presentation, all the environmental protections that used to exist, including the DFO patrols themselves, were eliminated in recent years by the federal government. So the indigenous protectors have no one in the public service to call on for help. While relating all of this and much more, Christine Martin also mentioned that they had to contend with the RCMP escorting and protecting the corporation’s drill-rigs. That comment immediately brought to mind this picture from our region in 2013. Is it any wonder that so many environmental protectors believe the RCMP is only in our communities to protect the corporate agenda and their equipment, and that they care nothing about the destroyed natural environment we will be passing down to our grandchildren? It is worth noting a comment made by another panelist at the Moncton portion of the forum. Kim Cornelissen, past vice-president of the Association québécoise de lutte contre la pollution atmosphérique, was presenting on how a defacto moratorium against fracking was achieved in Quebec. After listening to presentations from these women in B.C. and from me, Kim commented that in Quebec they did not have the same issues with police. I thought about this and concluded it was because the Indigenous Peoples of Quebec region did not have a significant organizational role in their alliance. It makes me embarrassed about our government and our national police force to say this. On a related note, I just returned from a protest action in Ottawa called Climate Welcome, organized by 350.org. The purpose of this action was to bring climate justice and renewable energy to the attention of our new Prime Minister, prior to the very important global climate issues conference being held in Paris in a few weeks. A sit-in was part of the plan, and 350.org is a very responsible organization. So, there were numerous legal information sessions and briefings for those of us who were willing to risk arrest to bring our message to the Prime Minister. I found it hard to believe what I was being told during these pre-action briefings, about the civility and laissez-faire attitude we might expect from the RCMP. Once out on the road, I was utterly dumbfounded that we did in fact illegally block driveways and roadways for multiple hours on several days and not even one arrest occurred. We did not even get severe warnings from the RCMP. Clearly there are diverse sets of standards for how activists are to be handled, depending on: how much media is at hand; how many indigenous people are involved; and, what seems the most effective way to muzzle our message that business-as-usual is killing our planet. In this article – Revealed: Police using pre-charge bail to muzzle protesters (from the respected periodical The Guardian), the term “pre-charge bail” is used to denote the same practice by UK police. It is clear that this practice is a violation of human rights as police are acting as judge, jury and executioner without even or ever pressing charges in the majority of cases. We hope that you are looking into this practice in your report. Numerous – too many to count – protestors were scooped up in 2013, read the injunction, and to avoid further legal consequences they were told to sign a statement that they had been read the injunction and would adhere to it. This process amounted to what in the UK is called for “pre-charge bail.” There are just so many ways that this is wrong! These additional sources of information are being brought to your attention because we want to underscore that the abuses and intrusions we experienced in 2013 in Kent County were not unique to that time and place. While your Commission struggles to assemble your report on events of that time and place, in 2015 the same violations of human, civil, political, and indigenous rights are taking place in British Columbia and perhaps other places in Canada. We ask that you consider the information presented above, and hold it in your minds and hearts as you move with all diligence and speed to prepare the report on what happened here in Kent County (Sikniktuk District of Mi’kma’ki) in 2013. 1 Here are some references for more information on “Free, Prior and Informed Consent (“FPIC): See Articles 10, 11, 19, 28, and 29 of the United Nations Declaration on the Rights of Indigenous Peoples, to which Canada is signatory, and also FPIC 101: An Introduction to Free, Prior, and Informed Consent. 2 For more on this, please take the time to listen to Ms. Huson’s presentation and follow-up questions on the video recording uploaded from the KAIROS Forum. Ms. Huson’s presentation begins at 1:09:30 at that link. After her presentation, and that of Christine Martin (see next page), there is a brief Q & A period which is also relevant. So, kindly stay tuned to the video recording up to c. 1:55:00.